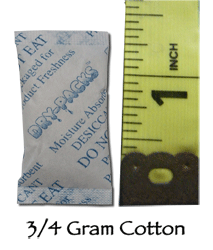 3/4 Gram Silica Gel Packet (Cotton) is used to absorb moisture and prevent Mold, Mildew, Corrosion, and Fogging. The 3/4 gram silica gel packets weigh .75 grams. They measure 1 5/16" in length, and 13/16" in width.